Based on a question from a student about printing with natural dyes, I did a test of printing with walnut dye. The block is a test block I use to demonstrate carving in my classes. 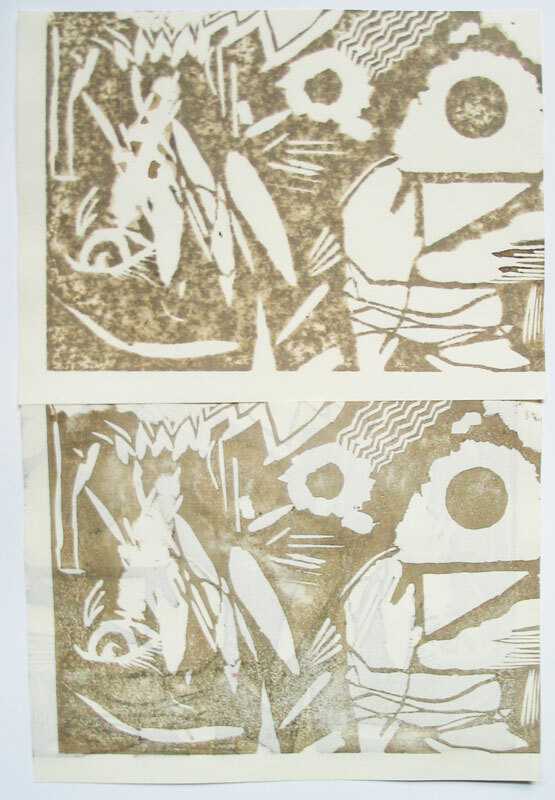 The top image is walnut dye printed without paste, giving the same blotchy effect as printing with any waterbased pigment and no paste. 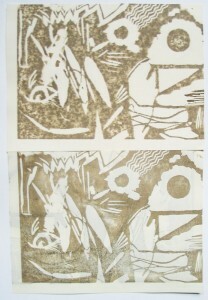 The bottom image is printed with paste. This test was a good transition from teaching to thinking about my own work. I recently finished a small (2×3″) block carved with images of nesting dolls as a meditation on my connections with my family, the generations before and after me and within me. For contrast and clarity of the image, I think the pink works better. 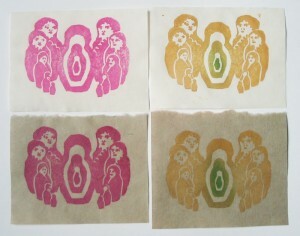 However, I decided to print more of the yellow with the green gradation, which gives a sense of something growing from within, like a germinating seed. This entry was posted on Tuesday, March 9th, 2010 at 11:11 pm	and is filed under Process. You can follow any responses to this entry through the RSS 2.0 feed. You can leave a response, or trackback from your own site.